Sound waves from loud engines disrupt neighbourhoods, cause hearing loss in workers nearby, and can even damage the engine itself. 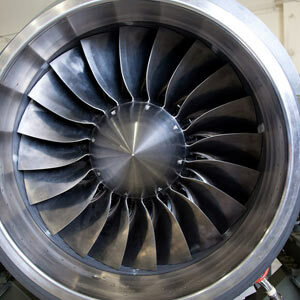 By muffling the noise of gas-turbine engines, a new device may also make them safer. That's why Agrawal has been developing a device that could curb engine noise not just in aircraft, but in factories, power generators, machinery, and other engines. While most sound-reduction measures such as noise dampers and ear protection try to cope with the noise, Agrawal's new device is intended to prevent the sound from being generated in the first place by changing the way fluids flow through an engine. In the heart of a combustion engine, fuel mixes with hot air. As the air and fuel are pumped into the combustor, turbulence and swirling vortices develop. These vortices vary in size, speed, and direction of flow. Differences in flow create differences in pressure inside the engine, and because sound consists of pressure waves flowing through a medium, the fluctuating pressures inside the combustor create noise. Agrawal says that combustion is like a microphone for that noise. When fuel meets flame, combustion adds energy to those fluctuations, thus making them louder. Noise can come from other parts of the jet engine—for example, air pumps and spinning turbine blades—but Agrawal says that combustion's uneven energy release is the main source of the incredible noise. Agrawal created a device that can be placed directly into a combustor. The porous, ring-shaped "sponge" is made of heat- and pressure-resistant hafnium carbide and silicon carbide. It's roughly the size and shape of a roll of electrical tape, but can be customized to match different engine types. 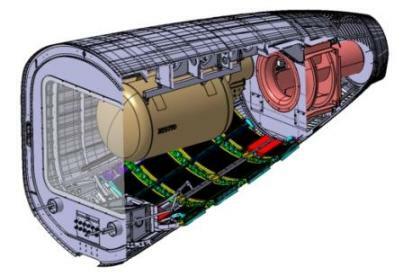 The device is not commercially available yet, but considering gas-turbine engines can cost anywhere from $100,000 to tens of millions of dollars, Agrawal says the device would comprise a small fraction of the overall cost. The sponge reduces engine noise in three ways. First, it evens out the air–fuel mixture inside the cylinder because the sponge's structure blocks some vortices from forming. By ensuring that the mixture flows evenly inside the combustor, the device reduces pressure differences, thus reducing sound production. It's the equivalent of whispering into a microphone instead of yelling, Agrawal says. The second piece is reducing combustion's ability to amplify those sounds—turning down the volume on the microphone, in Agrawal's analogy. "The amount of amplification depends on how intense the combustion is," he says. "If you have a lot of heat in small area, there is a lot of amplification. If the heat is spread all over, amplification is lower." Because the sponge spreads the fuel more evenly across the chamber, overall combustion intensity is lower and so the sound waves are less powerful. Thirdly, the device acts as an actual sponge that absorbs some sound waves after they're produced rather than letting them ricochet around the metal combustor. Together, these three mechanisms enable the sponge to reduce aircraft-engine noise by as much as 30 decibels, Agrawal says. That cut is enough to bring a jet engine's roar from the level of a rock concert down to the level of a lawnmower or chainsaw—loud, but not deafeningly so. Agrawal's research was aided by a U.S. Navy grant and the Ultramet company. Tim Lieuwen, an aerospace engineer at Georgia Tech', says the most interesting aspect of the new device is that it doesn't appear to harm engine performance while it reduces noise. Previous attempts to muffle the noise of gas-turbine engines had resulted in big losses in efficiency, he says. "In general, the more effort it takes to push air through the combustion chamber, the better it reduces sound." But that extra effort also makes the engine less fuel efficient. Lieuwen says that Agrawal's device provides the best of both worlds. So far the noise sponge has been tested only in laboratory combustors, but Agrawal says he thinks it could easily be incorporated into aircraft engines; it can be designed to fit almost any engine, and can be added on as a retrofit. Still, the only way to know whether the device can effectively reduce noise in gas-turbine engines would be to test it in a real-life scenario. 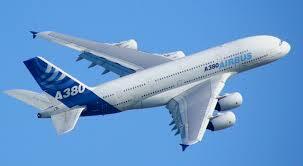 If it works, it could help extend the life of aircraft and industrial machinery, and make workplace environments safer. And that's music to our ears. With the airline industry's commitment to halve 2005 CO2 emission levels by 2050 Airbus and others to accelerate the development of alternative jet fuels, Airbus is now getting behind a project to examine the potential for using hydrogen fuel cells on commercial airliners – not to power the jet engines, but to replace the Auxiliary Power Units (APUs). are small gas turbine engines responsible for generating on-board electrical power and heat when the aircraft is on the ground, as well as providing power to start the main engines. 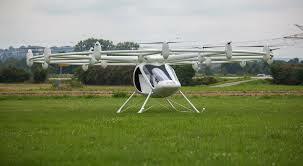 Hydrogen-powered aircraft - or CRYOPLANE - is an airplane that uses hydrogen as a power-source. 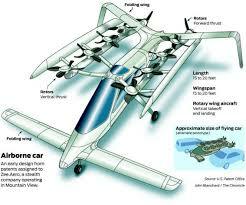 Hydrogen can jet engine can be used to power a fuel cell to generate electricity to power a propeller. Unlike normal aircraft, which use wings for storing fuel, hydrogen aircraft are usually designed with the liquid hydrogen fuel carried inside the fuselage, in order to minimize surface-area and reduce boil-off. If you haven't it is technology the improves in terms of price-performance faster and faster. And exponential trend improvement curve starts out flat, but suddenly at the knee point takes off like a rocket. Some say when a technology becomes digital it compounds in performance improvement. But that is not the whole story. Synergy comes about as the by-product of growing, interconnecting networks. Which of course we are experiencing today in every quarter of our lives. This is driven by the increase in the number of nodes, or here Robots in a network. As the number of nodes in a system increases in a linear fashion; so the increase in the number interconnection possibilities goes up in an exponential mode! Where Pn equals the potential total network and where Na is the number of nodes or agents. As the number of nodes accumulate linearly, the number of interconnection possibilities goes up geometrically. For example, take 4 nodes added in series: 1+1+1+1=4. You get a linear sum of 4. Only, if you interconnect each node to each other, you begin to see a nonlinear synergy: 4a(4a-1)/2=6. As the number of nodes go up in linear series, a surprising number of interconnections possibilities emerge. 10a(10a-1)/2 = 45 connections possibilities. Interconnect 1 million nodes, and: 1,000,000a(1,000,000a-1)/2 = ~4.9911. One-million nodes would add up to over 499 billion interconnections. The Laws of the Speed of Technological Innovation. Moore’s Law, Nielson’s Law, Kurzweil’s Accelerating Returns Law, are enabled by the underlying mechanics of the space of innovation possibilities: Pn=Na(Na -1)/2. To be brief, Moore’s Law; describes the constant that the number of potential transistors doubles every 18 months within the same geometric space until the scale begin to hit the weird world of the quantum space (10-19 mm). Nielsen’s Law says that the amounts of packaged bytes that can be sent down a line will double every 18 months. Ray Kurzweil’s Law of Increasing Returns; says that technological evolution will accelerate by an exponent over time. Harris’s Law of Increasing Diversity (me); says that technological and biological diversity expands in proportion to the number of potential interconnections. The richer the source of interconnections, the higher potential for innovation, the richer the potential for yet more nodes, and so on and so on. Yet all of these laws are empowered by Pn=Na(Na -1)/2. As Robots become interconnected via the Internet, they will form complex ecologies of Robots. As that happens, the number of Robots, along with price-performance, will grow and improve exponentially, whilst at the same time shrink toward the invisible. 'Bill Gates, the architect of the PC revolution, made a bold declaration not long ago forecasting another disruptive technology. “A Robot in Every Home,” his 2006 op-ed for Scientific American, described the kind of future in which bionic nurses care for the bedridden, wireless automatons do the yard work and service robots tidy up the household à la Rosie, the Jetsons’ humanoid maid. But in an age of WiFi and the ever-diminishing scale of microchips, personal automation doesn’t have to look like a robot with a feather duster. It may not, in fact, look like anything at all. Click to read the rest of this. The flying car is coming. This is being enabled by the intersection of three converging technologies: high energy density batteries, autonomous navigation powered by differential GPS; and lightweight, high strength lightweight materials. Under the wings of the XPRIZE Foundation; a multimillion dollar Transporter XPRIZE is being developed to inspire progress in this arena. Various designs are under way with vertical takeoff, vertical landing capability. One example is Zee Aero, funded by Google. 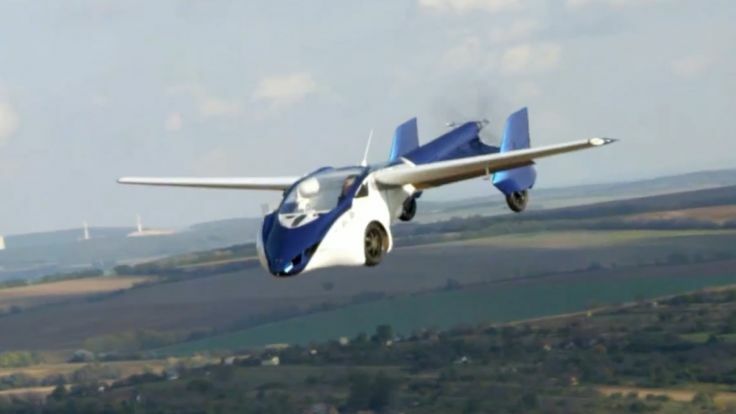 This flying car can take off and land vertically using a plethora of small electric motors turning four-bladed propellers and is narrow enough to fit into a standard shopping center parking space. 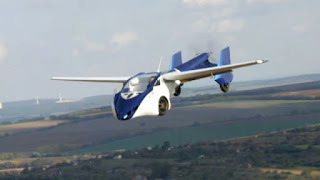 The Moller Skycar is a personal vertical take-off and landing aircraft, invented by Moller, who has been attempting to develop such vehicles for fifty years. 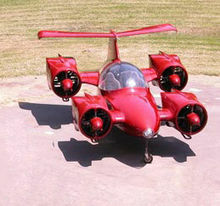 The M400 Skycar, transports four people. It is described as a car since it is aimed at being a popular means of transport for anyone who can drive, incorporating automated flight controls, with the driver only inputting direction and speed require. AeroMobil transforms in seconds from an automobile to an airplane that perfectly makes use of existing infrastructure created for automobiles and planes for real door-to-door travel. It fits into any standard parking space, uses regular gasoline, and can be used in road traffic just like any other car. As a plane it can use any airport in the world, but can also take off and land using any grass strip or paved surface just a few hundred meters long. It has been in regular flight-testing program in real flight conditions since October 2014 and is predominantly built from advanced composite materials. That includes its body shell, wings, and wheels. It also contains all the main features, such as avionics equipment, autopilot and an advanced parachute deployment system. AeroMobil also implements a number of other advanced technologies, such as a variable angle of attack of the wings that significantly shortens the take-off requirements, and sturdy suspension that enables it to take-off and land even at relatively rough terrain. (Adapted from Peter Diamandis' blog). It's finally here: The Back to the Future Hoverboard (well nearly)!! Firstly, for it to work you'll need the floor to be made of metal, so unless you can convince your local council to replace all its pavements, you won't be flying anywhere. The Hendo Hoverboard will set you back $10,000 (£6,000), so it's clearly a rich boy's toy. But with this invention now working for real, maybe the Back to the Future concept is closer than ever to becoming a reality. Hoverboards are something we’ve all wanted for so long. This neat piece of tech was the star of a recent video uploaded to YouTube by Hendo Hover. The hoverboard was built by Greg and Jill Henderson and is now looking to raise $250,000 on Kickstarter, where they’ve managed to raise over $21,000 so far. The board is powered by four different hover engines that emit a series of magnetic fields underneath the board, allowing it to hover above the surface. As above, the Hendo Hoverboard requires a certain kind of steel surface in order to work, so the Hendo team will also be creating a pop-up skate-park kits specifically for Hendo owners. A casually attired lone figure rides into view on a skateboard. Dismounting with all the grace of a Russian ballerina, the individual saunters over to a waiting Hoverboard. So has the luxury car brand Lexus actually figured out how? It seems 2015 is the year of the hoverboard. Last month, IFLScience reported on Canadian inventor and engineer Catalin Alexandru Duru, who broke the world record for hoverboard flight distance on open water. Keen "Back To The Future" fans will also have noticed that 2015 is the year Marty McFly famously rides his hoverboard in the second movie of the comic sci-fi fran. Lexus’s hoverboard creation, however, appears to be much sleeker in design than Duru’s invention and more impressive than Marty's stolen vehicle of choice. Yet it's almost too impressive, if you’ve got your cynical "could-this-be-true" CGI hat on. According to Lexus, research and development for the hoverboard has been in the works for about 18 months, during which time they have been working with a few unnamed professional skateboarders. Embedded into the levitating board are liquid nitrogen-cooled superconductors and permanent magnets, which means the hoverboard can only be used on surfaces with a metal veneer. In case you’re skeptical of the hoverboard shown in the video, Lexus has confirmed that there is metal inlayed into the surface of the skatepark. If the hoverboard shown isn’t real, it still looks very stylish. But if it is (and maybe I'm over-optimistic in hoping it is), we may have to wait for more information and release dates before the hoverboard becomes commercially available.